On March 3rd, I departed the United States for Haiti as part of an ongoing relief effort. I was recruited by a grass-roots organization of doctors, nurses, paramedics, medical technicians, teachers, architects and other volunteers. We brought with us, approximately 3,000 lbs. of medical supplies that were donated to the organization. In addition cement, rebar and lumber were transported by ground to help teach the locals how to rebuild. Clinics were held at schools, tent cities and orphanages. 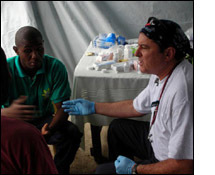 In a 48 hour period, over 1000 patients were triaged, diagnosed and treated. In addition, older children were taught how to care for the younger patients' wounds. The architects built three domed structures and helped assess the stability of some local buildings for occupancy post-earthquake. One of our members brought a water purification device and installed it at a local school. This device will yield 300 gallons a day of fresh drinking water.